In this Q&A with Stacy Perman, author of In-N-Out Burger: A Behind-the-Counter Look at the Fast-Food Chain That Breaks All the Rules, we uncover how the West Coast chain is shaking up the fast-food industry–one “animal style” burger at a time. At most fast-food chains, ordering a “Double Double Animal Style” would earn you a sideways glance and an awkward conversation. Not so at California-based In-N-Out Burger, where “secret” menu offerings and bizarre code names–in this case, denoting two burger patties with extra spread and fried mustard (yum! )–are only half the fun. Since opening its first store in 1948, In-N-Out has become a West Coast institution, with 232 locations, a rabid fanbase (that infamously includes Paris Hilton), and higher per-store sales than Burger King. What is its juicy secret? 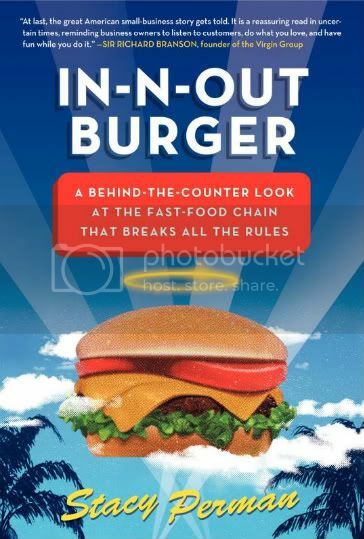 I spoke with Stacy Perman, author of In-N-Out Burger: A Behind-the-Counter Look at the Fast Food Chain That Breaks All the Rules, to get the inside scoop–animal style, of course. Let’s start with the basics. You’ve just arrived at In-N-Out, and you’re standing at the counter. What do you order? [laughs] Well, I normally don’t eat meat. So I love the grilled cheese, animal style, which is basically a cheeseburger without the beef patty. If I’m feeling really indulgent, I’ll get the fries, animal style. But then I have to go into, like, food rehab. Sounds delicious. I’m actually going to be in San Francisco this weekend–maybe that’s what I’ll order. You know, it’s funny you mention San Francisco. For years, chain restaurants, like Taco Bell, McDonald’s, and Burger King, wanted to open at San Francisco’s Fisherman’s Wharf. But the city and the merchants poo poo’d them all, because they didn’t want to share space with regular fast-food chains. In-N-Out was the only one they would allow. Because it’s not a regular fast-food chain? Exactly. If you think about it, it started in 1948, the same year the McDonald brothers launched McDonald’s. The restaurants were just 45 miles apart in Southern California. At the time, both of them were family businesses that used fresh ingredients. McDonald’s operates differently today. But In-N-Out’s owners never veered from its core philosophies. They don’t franchise. They vowed to remain private, and they did. They vowed to only use fresh ingredients, and custom-make every order, and they still do. That’s why, in your book, you say they’re “breaking all the rules”? Yes. If you walk into an In-N-Out, you won’t see a microwave or freezer. That’s fairly unusual for a fast-food chain. It also pays its employees incredibly well–way more than the minimum wage. [As of February 2008, In-N-Out was paying new part-time associates $10 an hour, which is almost as much as full-time workers make at Wal-Mart.] As a result, In-N-Out has one of the lowest turnover rates in an industry that’s famous for high turnover. Its owners have kept things good and simple, just as [founder] Harry Snyder intended. I’ve read that In-N-Out has a “secret” menu and its owners don’t really talk to the press. Does maintaining a mystique, of sorts, work in its favor? I think it plays a huge part. Everybody says the best advertising comes from word-of-mouth. By having a secret menu, In-N-Out lets its customers do its heavy lifting. When you tell someone else what “animal style” means, for example, you feel like you’re passing on a secret handshake. People get really into the whole thing. And In-N-Out has been really clever about not commercializing it. The spread has been totally organic. But In-N-Out also has to stay competitive, especially since so many restaurants serve burgers. Are there any plans to shake things up? You know, it already has a great thing going. Its menu has pretty much stayed the same since 1948. It hasn’t added Caesar wraps and children’s menus and breakfast options, like a lot of other chains. In fact, it’s taken In-N-Out 60 years to add 7-Up and Dr. Pepper. Even though the company is a lot bigger now than it once was, its employees still focus on what they do well: Making really good hamburgers, really good French fries, and really good shakes. The managers don’t have shareholders looking over their shoulders, so they can constantly focus on keeping the food quality high and the employees well-trained. In-N-Out doesn’t have to diversify into a Mexican chain or start opening stores in airports and on cruise ships. You don’t think In-N-Out should go public? No, I really don’t. When you go public, you open yourself up to a whole new set of pressures you have to follow, and I think that might change the unique culture of In-N-Out. Look at Krispy Kreme. It had a huge fanbase, and people were clamoring for more locations across the country. So Krispy Kreme obliged. It had an IPO in 2000, and it was very successful. But then the chain started rapidly expanding, and soon you could buy Krispy Kreme doughnuts in supermarkets. It just wasn’t the same product. There are so few “real deals” left, and In-N-Out is one of them. It’s weathered some family drama, too. Yeah. In spite of [former president] Rich Snyder’s death in 1993 and [former president] Guy Snyder’s death in 1999, In-N-Out has managed to survive and thrive, and really professionalize the fast-food industry. The more chains like McDonald’s and Burger King change and expand, the more In-N-Out sticks to its guns. In a way, it symbolizes the ideal American way of doing business: Treating people well, focusing on a quality product, and still being very successful. So what’s next for In-N-Out? Are there plans to move out East? It’s slowly expanding, with emphasis on the word “slowly.” When [family heir and soon-to-be owner] Lynsi Martinez takes control of the company, she could change things. But there’s a reason In-N-Out only exists in four states. Each restaurant gets its beef from specific commissaries, which are within a 500-mile radius. So jumping from Utah to New York seems unrealistic. Well, I’m glad I’m visiting California. I hope In-N-Out lives up to the hype. I’m sure you’ll love it. Just make sure you order off the secret menu.